As an introduction to Allergy Awareness Week, we’re starting with an overview of allergies, including those all important definitions (“what actually is an allergy?“), and a few examples of some of the most common allergy groups. Whether related to food, pets, medication or the outdoors, around 1 in 5 people suffer from allergies – and this is on the increase around the world! While most of us know that some allergies are really serious and can even be life-threatening, for the most part, we often make the mistake of thinking that more common allergies are nothing more than a runny nose and red eyes. However, allergies can be really miserable and can place significant challenges in your way. 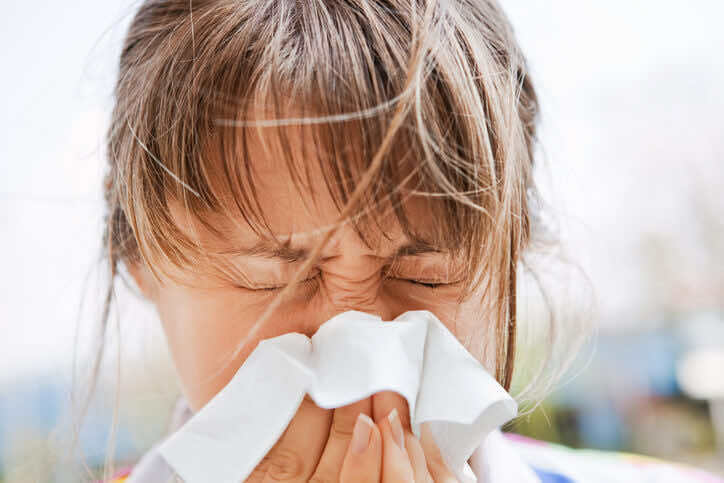 Allergies occur when your body’s immune system (the main purpose of which is to protect you and keep you well) overreacts to something in your environment that wouldn’t bother most people. If you have allergies, the difference between you and someone else that doesn’t have allergies is that your body believes that a substance (e.g. a moisturiser or a pet hair) is harmful to you, as an infection would be, and so produces a special protein that would normally act to fight off infections. This protein causes chemicals to be produced, which result in the symptoms of an allergic reaction. One common type of allergy is a skin allergy. Exposure to an allergen (the thing that causes the allergy), can cause dry, red, swollen or itchy skin that can drive you round the bend! Often, these allergens can be everyday products such as shower gels, hair dye, and nickel in costume jewellery. In some cases, skin can even be allergic to the sun! Anyone can become allergic to wasp and bee stings, too. If you are stung by one of these common little blighters, you might experience redness, pain or swelling at the site of the sting, making a bad situation even worse for you! It can be difficult to relax and take in the rays in the summer months if you suffer from this type of allergy, as you always have to remain vigilant for that ominous buzzing nearby. Food allergies are particularly troublesome, mainly because we all have to eat – so avoiding food isn’t really an option! Some people suffer from very severe reactions to foods such as peanuts, but many people live with mild allergic reactions too, to common foods such as dairy, fish, nuts and eggs. If you ingest these foods, you might suffer from vomiting, diarrhoea, itchy and swollen skin, and a runny nose or sneezing. Avoiding these foods is more difficult than you might imagine – think of how many products contain eggs (cakes, biscuits, batters and mayonnaise to name just a few)! Make sure to check the label of prepackaged food for allergy information. Some of the most common allergic symptoms that people suffer from are caused by airborne allergens. This may sound fancy, but it is really just a term to describe substances in the air, such as pollen, household dust mites and pet hair! These allergens are extremely difficult to avoid, and you can only hope to minimise your exposure. Airborne allergens (such as dog hair within the air) are extremely difficult to avoid! It is a fact that the majority of people who suffer from everyday allergic reactions haven’t seen their GP regarding these problems in the previous two years. There are quite a few options available for controlling your symptoms these days, and fully exploring these might give you some ideas that you haven’t thought of before. Have an allergy test! This is a simple test that can be done in most GP surgeries; identifying which substances you are allergic to is the first step to learning how to avoid them, or at least in gaining some control over your exposure to them. 3. Speak to Your Pharmacist! There are many remedies and medications to relieve your symptoms that can be purchased over the counter in your local pharmacy. You never know, a change of medication or a new medication altogether might help you get that relief you have been hoping for. (Visit London Doctors Pharmacy for more help and information). Get some support! Allergy UK is a great website that has a network of support contacts available across the country, who can can offer information and advice – visit their website at www.allergyuk.org or call their Allergy UK helpline on 01322 619898 to get in contact. So, if you think you’re suffering from an allergy and would like to get some more information, why not book a consultation with LDC? We have 12 London clinics, so should never be too far away when you’re in search of a “GP near me“. As always, if you need a private GP London Doctors Clinic is here for you!